Anverso San Jorge matando al dragón como lo retrató Bennedito Pistrucci. San Jorge matando al dragón como lo retrató Bennedito Pistrucci. Moneda de oro 110° Aniversario de la Moneda de Oro Soberana 1908 2018 de 1 onza Own a piece of history with this 110th anniversary Gold sovereign, at the lowest price at our online store! 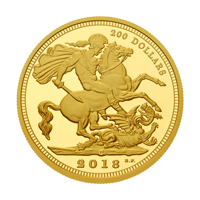 The coin is captured with stunning accuracy on its obverse with Bennedito Pistrucci's portrayal of St. George on horseback holding his horses reigns as he slays a dragon. The coin has been retrofitted with the date of its issue in place of the original, and above the date denotes the letter “C” which represents Canada. The reverse illustrates the bust of King Edward VII, designed by George W. DeSaulles, surrounded by the legend translated as; “Edward VII: By the Grace of God, Of all the Britain’s King, Defender of the Faith, and Emperor of India.” This gold coin is a brilliant re strike of the first coin ever produced by the Royal Canadian Mint with a highly limited mintage of only 500 coins! Stack your wealth in ounces with this celebratory sovereign gold coin today.